Bus from Kota Bahru to Kuala Lumpur is one of the popular route for the residents in Kota Bahru to travel to Kuala Lumpur. Even under fierce competition from budget airline, bus remains as the most popular selection of transportation due to frequent schedule and budget fare. 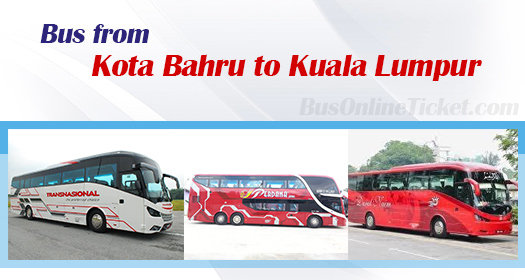 Perdana Express, Darul Naim Express and Transnasional are few bus companies offering bus from Kota Bahru to Kuala Lumpur. Perdana Express is having the most frequent bus schedules for this bus service. Their combined trips have up to 17 departures every day. Perdana Express is operating this bus route with double deck VIP bus while both Darul Naim Express and Transnasional are deploying single deck VIP bus. Many locals choose to travel with Perdana Express because of its luxury double deck VIP bus. The duration for bus from Kota Bahru to Kuala Lumpur is 9.5 hours. It is a long-distance bus service. Therefore, washroom breaks will be given during the bus journey. The bus fare for bus from Kota Bahru to Kuala Lumpur is starting from RM 44.00. The bus from Kota Bahru will pick up the passengers at Kota Bahru Bus Terminal. This new bus terminal is located adjacent to new Aeon Mall and Tesco. The drop-off point in Kuala Lumpur is at TBS (Terminal Bersepadu Selatan). TBS is a modern transportation hub in Kuala Lumpur with connection of Taxi, LRT, KTM and Kuala Lumpur Airport Express. We all want to avoid hassle. The best way to avoid it is to purchase the bus ticket in advance via online. Therefore, book your bus ticket online in advance at BusOnlineTicket.com now to avoid disappointment and get instant confirmation once the payment is done.